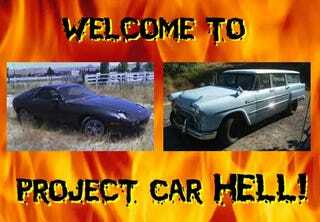 Project Car Hell: Porsche 928 or Checker Marathon? Remember that Top Gear episode in which our British automotive heroes had to buy running Porsches for £1500? You call that cheap? 1500 pounds is close to three American grand! Pure squanderation! What you need, dear hellbound friend, is a $1000 Porsche... and we ain't talkin' about no low-end 914 or 924 here, neither. How about this 1978 Porsche 928? Understandably, you might be skeptical. Does it run? Why, sure it runs! But we'd be less than honest if we didn't mention the seller's statement that it "used to run good but had it stollen for three weeks" (sic), with all sorts of hazily-defined badness perpetrated upon the engine such that it's probably, uh, not exactly in great shape. And that's not all; the faint of heart might back away in terror from a Porsche with "some electrical glitches mainly in the dash and gauges," but Project Car Hell is not for the weak! Come on, it's a thousand dollar 928! The 928 is a fine car, you say, but you've got a family to haul around and need something more practical (yes, Project Car Hell is all about practicality). What you need, sir (or ma'am), is this 1969 Checker Marathon wagon, available for less than half the price of the 928. It has a Ford engine under the hood (engine is frozen, but unless it's a MEL 410 or something you should be able to find a bolt-in replacement at your local junkyard). The windshield looks bashed, it has some floor rust, and the tailgate is beat to hell, but all you need to do is track down a parts car and... oh, wait, maybe this is a parts car. Don't worry about that stuff, though, because this thing has the potential to be the coolest station wagon ever, especially if you put a frame-twistingly powerful big-block in it, slap this TAXI sign on the top, paint it Day-Glo yellow, and offer free cab rides... TO HELL! Best of all, we get to go all meta on your azz here, because this ad features a reference to... Jalopnik's Project Car Hell! (thanks to Alex for the tip).